Many time you will be frustrated with unwanted calls. It the biggest problem which we have to face lot of time for the mobile phone uses. Today we have to discuss how to block any number on Android phone. At present time billion of users have to use different companies smartphone, and they face this type of problem many times. Lot of person call to someone for spending his vacant time or for fun. If you are doing any important work and someone doing fake call at your Android phone, then you will be frustrated too much. If you want to take rest from these unwanted calls then there are lot of option to stop or block any number on Android phone. Most of the mobile manufacturing companies provide inbuilt feature to block any number or you can also use any third party app in Android phone. This article is helpful for all those person’s who want to block any number on Android phone. Most of the mobile manufacturing companies provide inbuilt feature which allows you to block any number on Android phone. If you received any unwanted call from any unknown number many times then you will take following given steps to block particular unknown number. Step 1: From the Home screen tap on the call button. Step 2: Lookup that number from which you received unwanted calls lot of time. Tap on the number which you want to block on your Android phone. Step 3: Tap on the Detail option and tap on the block button. It will show you an message “Block this caller?”. Now, if you will no longer receive call or messages from that number then you must have to tap on the “Block” option. Now, you will see a red sign on that particular number that means the number is blocked. Now you don’t received any call or messages from that number. Step 3: Tap on the Detail option and tap on the unblock button. The red mark on the block number changed to white mark. Now, you will be able to received the call and messages from that number. You can also use any third party app to block any number on Android phone. You can easily get a list of different apps which helps you block any number on Android phone. We have to suggest Call Blocker app which is available on Google Play Store. It is free to use and take 861 KB in your phone. Call blocker app allows you to reject unwanted calls automatically. You have to add the number in this app to block any number on Android phone. Step 1: Click on this link to download the call blocker app from Google Play Store. From call log: It will allows you to choose any number in the black list from the call log. From Contacts It will allows you to choose any number from the contact list. Input Number: It will allows you to input any specific number in the black list. Step 3: After adding one or more numbers in the black list, unknown number will not interpret you. Note: If you want to remove any number from the black list then choose then particular number and tap on the “Delete” button. Now, you will be able to receive the call or message on your Android phone. I hope you like this guide, these tips will be helpful for all of you. 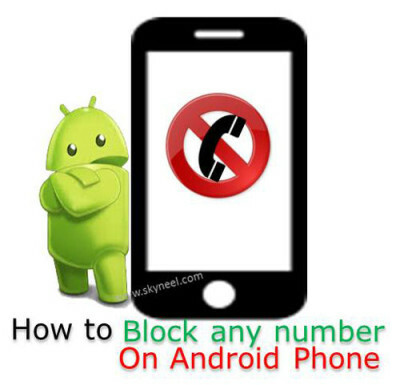 This article helps you to how to block any number on Android phone. Give your important suggestions regarding this article in the comment box. Thanks to all.